For the past few years (well I guess since I've had kids) I really haven't been into Mardi Gras. I can't even tell you an exact reason why, I just haven't been into it. Well, this year Noah was all about Mardi Gras! Luckily we live within walking distance to the parades so if there was a parade rolling, Noah was there. Clint and Noah were parade buddies this year since I am housebound with Liam. Noah would come home after each parade so excited to show me his throws. He even caught a rose and when he came home he told me he caught it just for me, how cute is that? Some of his favorite throws this year included the purple hat in the picture, countless stuffed animals and a stuffed arrow that he uses as a light saber! 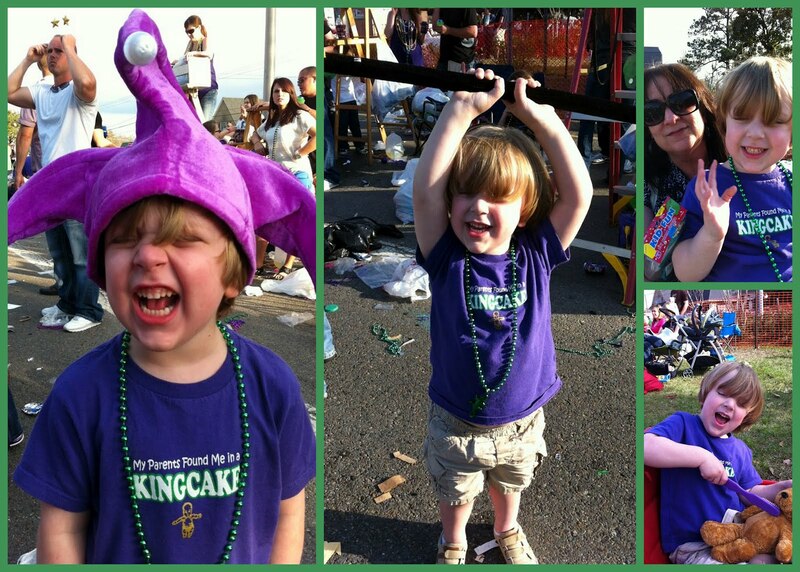 As much as Noah loved Mardi Gras this year I am happy to see it go for one big reason...the noise! We live at the end of the parade route and I could hear dance teams and marching bands till midnight some nights. Eeek. See ya next year carnival!